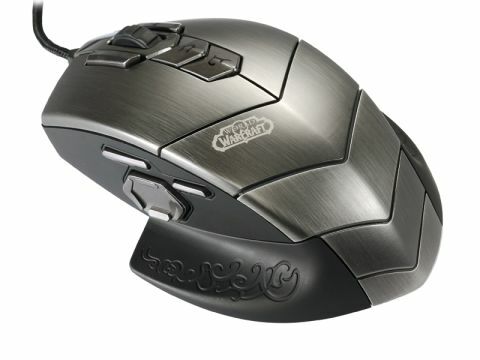 This WOW MMO Gaming mouse costs £75. Yup, you read that right, £75. For a mouse that only really struts its stuff in one game. Stop laughing at the back! Need more convincing? Well, er… it's got some swirls on its flared base, oh and can glow different colours. What's that, you're still not rushing out to buy one? To be honest, we're not convinced either, if any peripheral ever smacked of 'cash in', this would gleefully scoop the award. The finish would be more at home on a Halo accessory – indeed, if it weren't for the WoW badge, we don't think anyone would guess which game this was supposed to work with. The weight and build quality is surprisingly uninspired, and in use there's little support for the palm of your hand - it's little more than 'okay', though those hooked on Arena matches may garner some cool tricks from those extra buttons, but we're not convinced about that either. A keyboard is a much better input option for normal macros than twisting your thumb round to use a D-pad on the side of this thing. There aren't many games that justify specific hardware, and while WoW does offer an audience of 11 million eager players, this is so unremarkable and expensive as to be little more laughable.